Good Dog! Autism Companions relies heavily on Social Media and the internet to spread our mission and the love that our dogs provide to the autism community. However, it is our desire to respect our families individual circumstances and privacy preferences. Please take a moment to fill out the below form so we may adhere to your preferences. Please note that Good Dog! 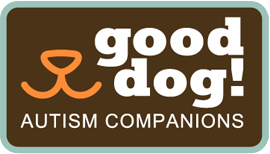 Autism Companions (GDAC) reserves the right to share ALL photos of dogs trained by Good Dog! The below is privacy preferences for your individual family. The use of the word 'photo' below refers to printed and digital photographs as well as videos. Please indicate how you would prefer to be contacted if we have questions regarding your Privacy Preferences. For example: A Hero for Hunter, Henry's Wish Dog, A Dog For David etc. By pushing "SUBMIT", you agree that as long as Good Dog! Autism Companions follows your indicated preferences we may use your name, photos and images in our social media, maketing materials and web site.